On-site education on current situation of coffee Industry and coffee farmers in Tanzania, with visits to Tanzania Coffee Board, Tanzania Coffee Research Institute, Kilimanjaro Native Cooperative Union, Kibosho Kati Rural Cooperative Society, Kirima Boro Rural Cooperative Society, Vuasu Cooperative Union, Chego Rural Cooperative Society, Kindoroko Rural Cooperative Society and coffee farmers. I travelled to Moshi to give some advice to Mr. David G. Mhando, a Tanzanian student of ASAFAS who conducted research on Tanzania’s strategies to cope with the falling International price of coffee. His main research site is Southern Tanzania, but he has also tried to collect relevant data from Northern Tanzania and to conduct interviews at several institutions of the Tanzanian coffee industry during this field trip. 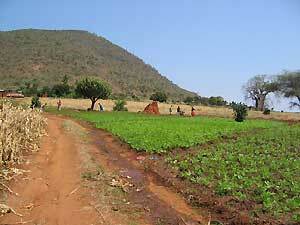 I conducted research on dry season irrigation farming at the foot of the NorthPareMountains in the Kilimanjaro Region. I have continued research work at the same place for more than ten years. The tentative findings are: (1) this farming activity is overly flexible in terms of the membership and plots used, and (2) this activity is gradually being replaced by more profitable economic activities such as brick and gravel making. 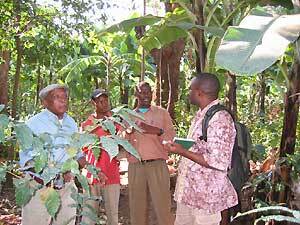 1) We need to conduct research on the same topic as Mr. Mhando in other coffee production areas in order to get an overall picture of the Tanzanian coffee industry. 2) We should have greater opportunities to exchange ideas with the academic staff at University of Dar es Salaam, Sokoine University of Agriculture and other institutions. Mr. Mhando interviewing farmers near Mt. Kilimanjaro. View of an irrigated field of kidney beans.